Enjoy the pleasure of a horse-drawn carriage or sleigh ride in order to explore Mittenwald and its surroundings from a different point of view. On a trip through the nature reserve "Riedboden" or to our romantic mountain lakes "Lautersee" and "Ferchensee" ("lake tour") you get to know our beautiful countryside. 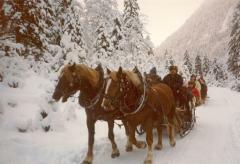 What better way to enjoy the splendor of winter in the picturesque mountain scenery of the Alps than with a horse-drawn sleigh ride around Mittenwald?! Just snuggle up under warm blankets and glide through the snow-covered countyside! 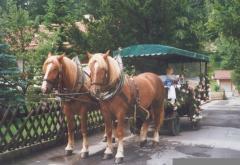 During summer, you can experience our countryside in one of our horse-drawn carriages. An unforgettable experience for children and adults alike. Our regular tours are operated as a service where each carriage / sleigh may be shared with other passengers (up to 12 passengers per carriage). If you like to book an exclusive tour where the carriage is not shared with other passengers, please contact us to receive an individial offer. If you arrive by train, it is a 15-minute walk to the departure point. Please follow Bahnhofstraße and Hochstraße before you turn left into Obermarkt. At the end of the pedestrian area, you will arrive at the departure point. If you are arriving as a larger group, we can pick you up at the train stration (on request). We can also organize tours for larger groups or work outings. Feel free to ask! 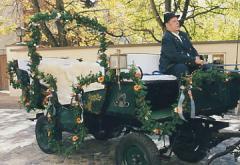 A horse-drawn carriage will make your very special day unforgettable. We will organize a romantic coach ride. If you like, we can organize a wonderful decoration of our coach. Even in case of bad weather we will ensure that your journey is a success.